Unlike other parrot food, Oven Fresh Bites™ bird food does not utilize corn or wheat as the primary source of dietary energy and protein. Oven Fresh Bites™ is oven baked and uses wholesome ingredients that offer a variety of nutrients and textures such as oatmeal and sunflower meal. This special blend of bird food has been tried and tested by bird and parrot owners alike. Combine 50% of the seed based or other diet with an equal amount of Oven Fresh Bites™ gourmet parrot food. Fill food bowl approximately 30%. Feed three times daily for 15 -30 minutes, removing the food between meals to determine how much of each food type has been consumed. If your bird has eaten Oven Fresh Bites™ gourmet parrot food, increase the amount with each feeding until the parrot is eating 100% of its new and nutritious diet. Seeds should be used only as treats. This method may take a few days or weeks, depending entirely on how your parrot responds. 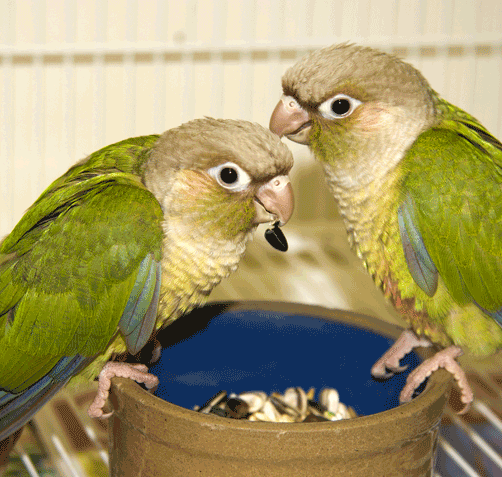 The advantage of the association feeding technique is you’re knowing that your parrot will not go without food, but will have an appetite at each scheduled feeding. Offer a few of the Oven Fresh Bites™ gourmet nuggets as a treat for several days and remove all parrot food from the cage at night. Feed the regular diet free choice during the day. After 5 to 7 days, introduce 100% Oven Fresh Bites™ gourmet parrot food for the morning feeding. If the parrot has not eaten the food by the afternoon, remove the new diet and replace with ¾ of the normal ration. Remove it before bedtime. During the next few weeks increase the amount of time that the morning portion of Oven Fresh Bites™ nutritious parrot food is left in the cage before giving the parrot an evening feeding with the previous diet. Repeat the process until the morning ration is fully consumed and offer a second helping in the evening. Most parrots, especially psittacines, prefer to feed from the treetops or the highest elevation possible where the risk of exposure to predators is minimal. To capitalize on this natural behavior feed a 50% ration of the regular food in its original position, add another similar bowl which contains an equal amount of Oven Fresh Bites™ nutritious parrot food in the highest location possible in the cage and add a water vessel nearby. Because parrots prefer the higher location, many are inclined to investigate the new bowl and test its contents. Observe the amount of parrot food remaining in each bowl at the end of the day. As the amount of food consumed from the top bowl increases, you should proportionally decrease the amount of food in the lower bowl. Eventually the parrot will be eating only Oven Fresh Bites™ gourmet parrot food. This method ensures that your parrot will never be without a familiar food and the time required to make a complete transition can be extended. If your parrot offers resistance to this natural and nutritious food, try these helpful hints which have proven to be successful for other bird owners. Your bird may not immediately recognize the new diet as food, be patient. Try introducing Oven Fresh Bites™ gourmet parrot food as treats, especially out of the cage! Try hiding in a favorite foraging device. Because parrots are flock oriented, your bird might benefit from exposure to a converted role model. Try pretending to eat Oven Fresh Bites™ yourself! Sometimes seeing a flock member “eating” the food can convince a skeptical parrot to try the new diet. If your parrot remains reluctant to experiment with the new food seek additional advice from your veterinarian. Malnutrition and obesity are one of the most commonly reported health risks in companion birds. Birds that eat primarily seed-based diets do not receive adequate vitamins and minerals. Seed-based diets are the equivalent of humans eating “junk food” for breakfast, lunch and dinner! These issues can be remedied by feeding a nutritionally balanced diet such as Oven Fresh Bites™ nutritious parrot food. Your avian veterinarian should routinely evaluate your bird’s overall health. After your parrot has received a wellness exam you will be ready to begin the conversion process to our natural gourmet food. Your veterinarian will help you identify strategies for food transition, and can help monitor your parrot’s progress throughout the conversion process. Weighing your bird during the transition process can ensure that your bird is receiving adequate calories. Oven Fresh Bites™ gourmet parrot food is formulated to be fed free choice and is intended to be your parrot’s primary source of nutrition representing 75% of your pet’s daily food consumption. Nuts and seeds should not exceed 5 – 10% while fruits and vegetables may be 10 – 15%. Papaya, sweet potatoes, spinach, chard, mango, carrots, parsley, banana, pumpkin, broccoli, cranberries, corn, snap peas, English peas, blueberries, peppers, romaine lettuce and more. Inquiries about making the transition to Oven Fresh Bites™ gourmet parrot food may be directed to one of our conversion specialists at info@caitec.com.